Type 97. 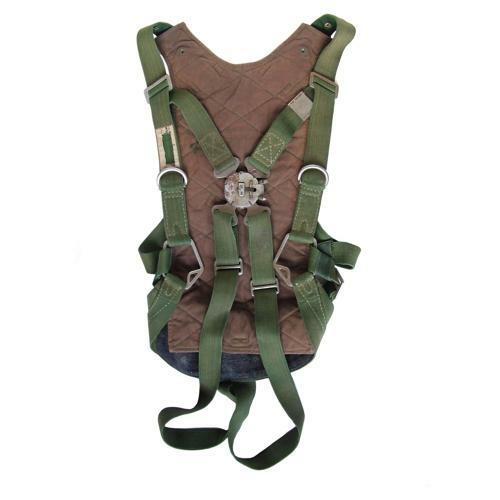 This was the most widely used parachute harness during WW2 and is commonly referred to as the 'fighter pilot harness'. Popular with both Naval and Army pilots, it was manufactured in dark green webbing of cotton/silk mix. This early (pre 1940) harness has a nickel plated steel 'quick-release' box that features a sprung hinged front plate. When a small flap is lifted the user can squeeze a pair of small levers enabling the front plate to open. A nickel plated slot on the upper left harness strap was used to attach the rip cord device into position. The pack (absent) also acted as a seat cushion and could easily be attached/detached via two clips and the 'D' rings on the front of the harness. The rear of the QR box is marked with a tiny naval anchor. Large cotton label on one of the seat straps. This has printed kanji nomenclature indicating the harness type, production serial number, date of manufacture and the manufacturer's details. This example is a Special Type 97 (type 2) with the serial number 1890366. It was manufactured by the Fujikura Aircraft Industry Co. Ltd on 14th September 1939. The harness show some light use and wear with light fading. The QR box has some surface corrosion (later examples had alloy fittings) but functions correctly. Fitted with the original quilted brown cotton backpad. One label is absent/torn. Very good overall condition and extremely rare and difficult to find. Stock code S23335.